As a long-time admirer of the work of Sergei Rachmaninoff (specifically the Piano Concertos and Symphonies) and as a recent admirer of Dave Malloy (who wrote the score and book of Natasha, Pierre and the Great Comet of 1812), Preludes -- Malloy's new biographical play-with-music about Rachmaninoff -- sounded almost irresistible. The play itself, an LCT3 offering at Lincoln Center Theater's Claire Tow playhouse, turns out to be an intriguing, challenging evening of theatre. Malloy and director/co-conceiver Rachel Chavkin (also from The Great Comet) have used events of more than one hundred years ago to examine creativity, psyche and the artistic mind. The artistic mind both past and present, that is. 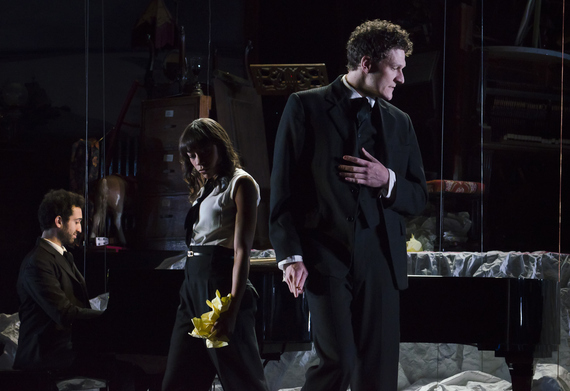 The play centers on the writer's block that the composer suffered in the final years of the nineteenth century. Rachmaninoff (1873-1943) gained instant fame in 1892, at the age of nineteen, with his still-powerful Prelude in C-sharp Minor. (Even today you'd recognize those crashing chords.) His First Symphony -- which I find to be pretty nifty -- was devastatingly received in 1897, so much so that the still-young composer went into a full-scale depression which lasted three years. Preludes starts and ends with Rachmaninoff's pioneering treatment by psychiatrist Nikolai Dahl. While the sessions occurred in 1900, Malloy takes us earlier and later; much later in some cases, as there's a song about the subway and even an exchange which seems to be a conversation between Rachmaninoff and Malloy himself. 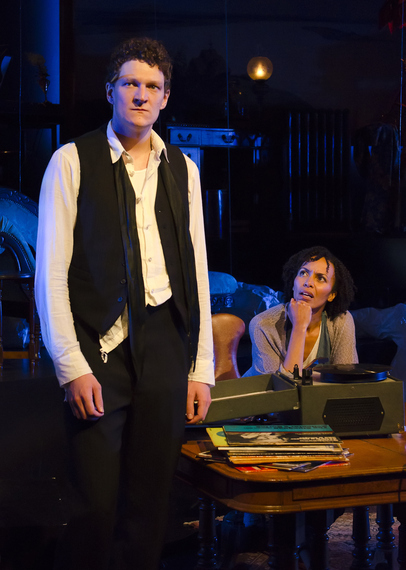 (The unnamed character describes growing up listening to his parents' LP of Van Cliburn playing the Second Piano Concerto, thus imparting to the artist that whatever his problems, his work will indeed be remembered.) With the time period variable, Malloy uses wild anachronisms to make Sergei's predicament more immediate to current-day audiences. If all of this sound interesting but slightly archaic, that is indeed the case. Malloy and Chavkin -- working here with their Great Comet designers Mimi Lien (sets), Paloma Young (costumes) and Bradley King (lights) -- weave a wondrous world for us. There are at least three sequences in which music, drama and design combine for stunningly dazzling theatre, using sections of the first theme from the first movement of the 2nd Piano Concerto; the second movement of Beethoven's Sixth; and the second theme from the first movement of the 2nd Piano Concerto. These are almost astonishingly moving, displaying the full potential of Malloy & Chavkin's vision. These segments are countered, though, by some stretches that are not quite so inviting. 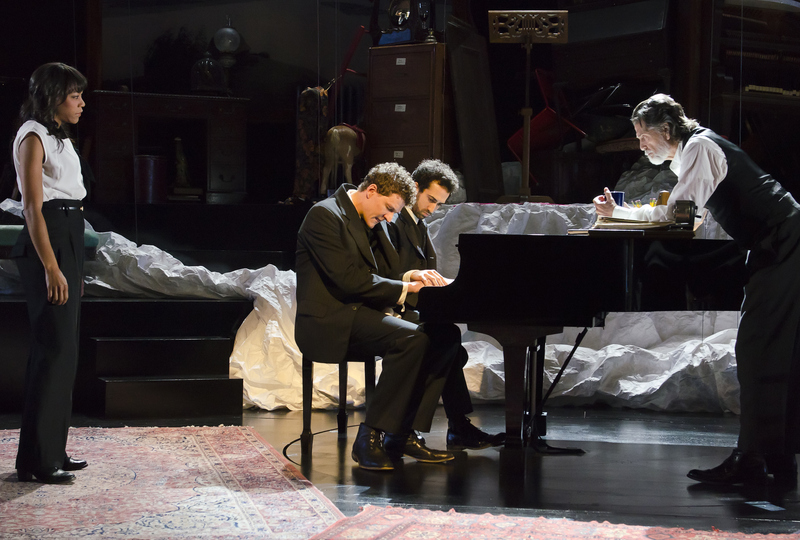 Preludes combines Rachmaninoff's psychiatric sessions with Dahl (Eisa Davis); his courtship of first cousin Natalya (Nikki M. James), leading to a scene in which they receive dispensation from the Czar to marry; interactions with his pal, the singer Chaliapin (Joseph Keckler); and visits with fellow artists Chekhov, Tchaikovsky, Tolstoy and Glazunov (all played with a crotchety-old-Russian twinkle by Chris Sarandon). James -- well-remembered as Neutrogena, or whatever her name was, in The Book of Mormon -- is a supportive but strong presence, providing some pristine singing along the way (including a glorious "Vocalise"). Davis, who played the mother in Passing Strange, is an unlikely choice as the nineteenth century Russian psychiatrist. I suppose, though, this sort of thing is to be expected from Malloy and Chavkin. As it turns out, their instincts are spot-on; Davis-as-analyst brings us right into Rachmaninoff's story, makes matters clear for us twenty-first centuryites and does a fine job with her songs. Presiding over it all is Gabriel Ebert, giving an impressively rich performance in the complicated portrayal of the troubled artist. Ebert -- who appeared opposite Mary Louise Wilson in the early LCT3 offering 4000 Miles -- also did a memorable job as the rubber-legged candy vendor in Brief Encounter, and garnered himself a Tony Award as the brashly objectionable father of poor Matilda. Based on these four bravura and very different performances, one wonders just how wide Ebert's talent is. Spread throughout are patches of musical excerpts from Rachmaninoff, balanced by contemporary songs by Malloy (some derived from themes by the former, including one called "Natalya" stunningly performed by James). Malloy solves the piano-playing problem by having a second Rachmaninoff -- identically dressed, but much shorter -- share the stage with Ebert. This is Or Mathias, who was musical director of The Great Comet and turns out to be one helluva piano player on the center-stage Yamaha. He is accompanied by two musicians on synthesizers. Compelling? Yes. Entirely successful as a play, or as a musical whatnot? Not quite. But Preludes is an exciting experiment, buoyed by Malloy & Chavkin's unique vision; Ebert's masterful performance; Orr's piano playing; and all that Rachmaninoff roaring through the intimate playhouse on the roof of the Vivian Beaumont. Given LCT3's standard ticket price of $30, Preludes earns a high recommendation. Surely, you're unlikely to see anything quite like it.